Dashlane’s security dashboard gives you an at-a-glance view of the security of your passwords. These days, a third-party password manager is de rigueur for anyone venturing on to the internet with a clutch of online accounts. You won’t last long relying on weak, easily guessable passwords to protect your personal data when online, so password managers like LastPass that lock all your passwords away behind a single, master password, have much to recommend them. Dashlane is a lesser known entity among password managers, but with the release of version 2.0 is aiming to boost its profile. There are lots to like: AES-256 encryption that derives its key directly from your master password, so it’s not stored anywhere, for example. You can also tie your stored passwords to a single device rather than have it securely synced across all your computers and mobiles. You can even tie Dashlane in with Google Authenticator to add another layer of two-factor authentication for even greater security. Dashlane works with Internet Explorer (Windows), Safari (Mac only), Chrome and Firefox – the installer will offer to add browser add-ons for all supported browsers, or you can select which ones to install by clicking Custom. You manage your passwords and digital wallet through a standalone app, which opens at the Security Dashboard, which gives you an overall safety rating based on the strength and repetition of your passwords. You can then easily track down these passwords and change them to something better, such as a random string of characters generated by Dashlane itself. 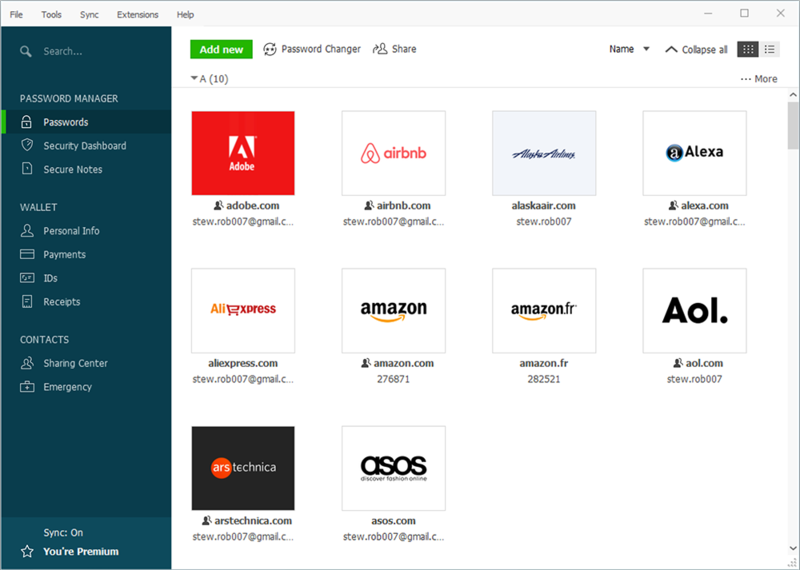 Dashlane will even alert you when it detects a website has been breached, potentially compromising your account and password on that site, as well as any other sites that share the same password. It’s a neat touch and another good reason to give it a go. This is the good news, that if you’re starting out with your first password manager then there’s much to recommend Dashlane – it’s robust, helpful and free on mobile as well as desktop. Unfortunately, things get complicated should you wish to transfer from another password manager. Despite seemingly making things simple with a range of import options, the web is littered with complaints from frustrated users unable to import all – or even some – of their passwords. We experienced this ourselves – trying and failing to get passwords directly imported from LastPass on two separate platforms. Eventually, we managed to get our passwords transferred on the Mac using Firefox’s own password manager as an intermediary. Very unsatisfactory. All of Dashlane’s features – the password manager, autofill and digital wallet – are free across all devices, but if you want to be able to automatically sync your data across all your devices, back up your encrypted information to the cloud in case you lose a device or access your Dashlane account through a web browser rather than the standalone app, you’ll need to upgrade to the Premium service for $19.99 a year. What's new in 6.1914 (see entire changelog)? Dashlane has the potential to be one of the best password managers out there, but it’s let down by sub-par migration tools that will deter those wishing to switch from another service.